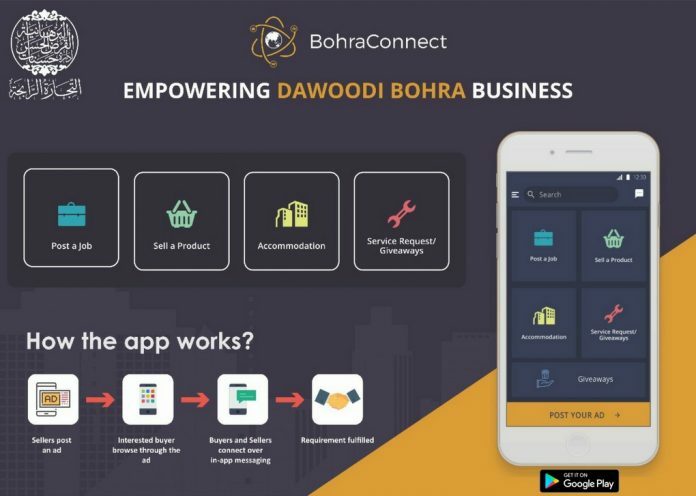 A group of young Dawoodi Bohra entrepreneurs, under the guidance of the community’s business advisory department al-Tijaarat al-Raabehah, have designed an app called Bohra Connect. It is a collaborative effort with dbohra.com, an initiative of Al-Tijaarat al-Raabehah to build an online global business community for Dawoodi Bohras. The app is now available on the Google Play Store, and intended for use by Dawoodi Bohra community members. Community members can list products, jobs and services on the app as well as rentals from anywhere in the world and instantly gain access to interested consumers globally. Ideal for both buyers and sellers the app strives to increase the reach of even the smallest businesses and provide a platform where community members can safely transact with one another on a global level. Manage jobs- where employers can list vacancies and prospective job hunters can apply for those jobs. The entire process is expedited by one touch job applications. List accommodations- whether members are traveling for business, pleasure or religious gatherings, houses and rooms can easily be listed, viewed and booked. Request services – members can post their service requirements such as catering or event planning and have the relevant parties respond with quotations and other relevant details.